If you’re on Twitter, a month or two ago, #MandarinMonday started surfacing. People dedicated some tweets to Mandarin and generally wanted to chat using Mandarin. I thought this was great! Now, fast forward to this week. 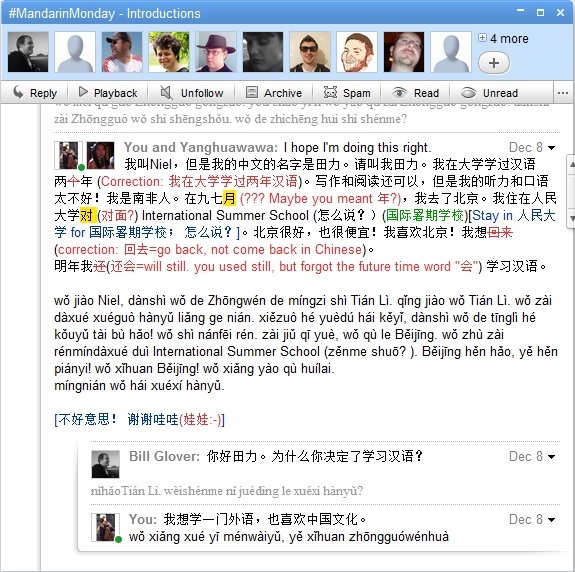 Bill has gotten some folks together to start a Wave using Google Wave to help with foreign language learning. I’ve been using (or lack of it) Google Wave since October, but have seen no use for it, until now. The Wave has a few folks trying to improve their Mandarin, however another awesome addition is 娃娃. She is also on Twitter. She is a native speaker of Mandarin, thus we all chat in Mandarin, she comes along and helps us with errors. It’s amazing!